The NC Innovative School District (ISD) and their partner Achievement for All Children (AAC), selected Bruce E. Major to lead the intervention efforts at Southside Asphpole Elementary in Rowland, NC. “We were looking for a proven leader who fit the needs of the community and that was motivated by the challenge of increasing student success at a low-performing school. We found an outstanding educator who delivers on all accounts. 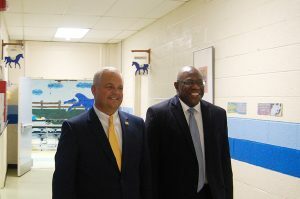 Throughout his career, Mr. Major has demonstrated his commitment to maintaining high educational standards for all students, regardless of their circumstances,” said Tony Helton, CEO for AAC, the organization hired by the ISD to manage operations at Southside Ashpole. As the school director, Mr. Major’s responsibilities include implementing and supporting Southside Ashpole’s goals, mission, and vision; promoting the educational development of each student; developing and implementing curriculum; supervising, mentoring and evaluating teachers; serving as spokesperson for Southside Ashpole to students, parents, teachers, community and the state; and networking with the local community to develop and support activities at the school. Since 2014, Mr. Major has been working in China. He was the Chief Administrator at Wahaha Schools in Hangzhou and a Principal at Ameson American High School in Shaoxing. Prior to that, Mr. Major spent 12 years at Sugar Creek Charter School in Charlotte, NC. While there, he served in various roles including Chief Operating Officer, School Psychologist and Assistant School Director. Bruce Major earned a bachelor’s degree in psychology from the University of South Carolina in 1992—with a focus in Child/Adolescent Psychology and African-American Studies—and a master’s degree in school administration from Gardner Webb University in 2010. Currently, Mr. Major is a doctoral candidate in educational leadership at Gardner Webb. Mr. Major will begin his new role at Southside Ashpole on July 16.